The Climate Resiliency Report, the first of its kind for the City of Grand Rapids, was developed by WMEAC in 2013. 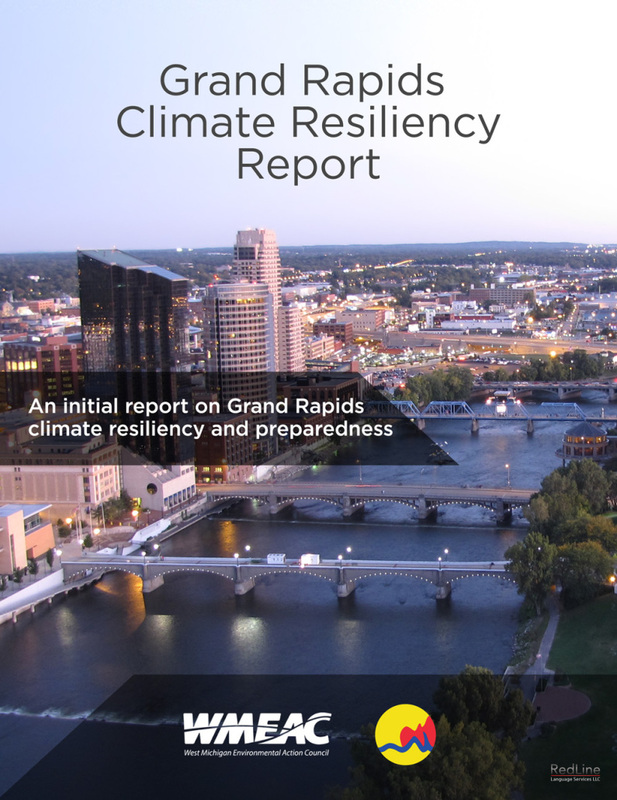 The Climate Resiliency Report outlines the current condition of Grand Rapids climate resiliency and offers recommendations as to how the City of Grand Rapids can both impact and adapt to climate change. The Grand Rapids Climate Resiliency Report originated from a grant the City of Grand Rapids received in 2012, when Mayor George Heartwell was recognized by the U.S. Conference of Mayors for the City’s efforts in confronting climate change. The goal of the Climate Resiliency Report is to both spur a larger community conversation around processes that will enable Grand Rapids to become a more climate resilient city, and to spur many specific, short and near term projects, policies, programs and plans to mitigate the effects of climate change. In the report, WMEAC was able to forecast, with the help of Elena Lioubimtseva of GVSU, that by 2022 without making any changes the temperatures will rise 2.6% and by 2042 will rise by 8.5% along with hotter and longer dry seasons in the summer. The Climate Resiliency Report also documents that these climate changes will most likely have a negative impact to low income families. However along with these findings, the Climate Resiliency Report also outlines small near term solutions that Grand Rapids can work with in order to curb climate change or adapt to it. Some of those recommendations include investing in green space and improving our cities tree canopy, begin working on improving our cities energy autonomy, and implement green street infrastructure materials and maintenance techniques. Winter will be affected most greatly with higher precipitation and volatility in temperature. Summer will become drier and warmer with increased volatility in temperature. There will be an increase in extreme weather storms resulting in 1 inch per 24 hrs. There will be an increase in freeze thaw cycles within winter and spring. This will cause many issues with the longevity of infrastructure.